﻿ City View Hotel Kaherah. JIMAT di Agoda.com! City Hotel menghadap ke Muzium Mesir dan terletak 250 meter dari stesen metro Sadat. Ia menawarkan lokasi yang hebat untuk meneroka Kaherah. Bilik-bilik mempunyai balkoni dan TV satelit. Bilik-bilik yang berhawa dingin di City View Hotel dihiasi dengan hiasan Mesir dan karya seni. Bilik mandi moden mempunyai tab mandi dan dilengkapi dengan sabun serta produk yang dapat digunakan oleh tetamu. Kakitangan City View Hotel dengan senang hati mengaturkan lawatan dan pelancongan di sekitar bandar. Hotel ini mempunyai bilik komputer dengan internet percuma yang boleh digunakan oleh tetamu. Wii percuma disediakan di kawasan awam. Di Ali Baba Restaurant, anda boleh menikmati pemandangan panorama Muzium Mesir, manakala masakan kepakaran tempatan disajikan dengan minuman oriental. Bufet sarapan juga disajikan di sini. Dataran Tahrir dengan restorannya yang meriah dan kawasan kafe terletak sejauh 3 minit berjalan kaki. Please note that guests who book for 2 or more nights get a free pick up or drop off from the airport. The hotel is very simple, but in a great location. Everything was fine in our stay... If you stay more than 2 nights they has a transfer from the airport to the hotel that is really great because the airport taxi are so annoying! Please find a more updated hotel with honest service, quieter location, sans the noxious smell and better quality restaurant services. Their guided tours are a rip off as well. 1. Best location, 2. Staff performance, 3. None. The good things; the location. The museum is across the street by 2 min walk. The staffs were very approachable and friendly. The bad things. Water didn't come out in the room when checked in until 3am. They said not a problem with the hotel though. Gave us a free mini bar drink but that was bad unfortunately. The breakfast. Gave 2 stars in my opinion. I wanted vegetables but not ready on time. We didn't eat much. 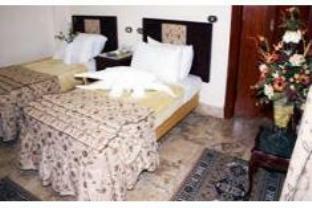 how has gave good scores about this hotel and agod usuer could give 7.5 score. the location which shown in map is wrong. i had to use taxi and ask someone where is this hotel but nobody knee...... i called the hotel and took phone to a taxi driver then a taxi driver could find the hotel. only one strenth is location. it is near Cairo Musuem walking distance for 2~3min and Nail river. i dont recommend to stay here. hotel front is really kind to help travelers. also they introduce a tour guide with a reasonable price. we felt welcome at this hotel, from the moment we arrived in cairo to the moment we left. all staff from the bell desk to reception to chefs were all great and very hospitable. we were given a nice room with great view of the egyptian museum and tahrir square. I really enjoyed my stay at the City View Hotel. The staff were very friendly and efficient in doing their jobs. I also arranged some private all day trips with their wonderful yet reasonably priced tour service, and ended up having a great private guide in Ms Badry. The breakfast buffet was simple, but fine. When I need to use their Internet service or have laundry done, service was quick and reliable. Some people complained about the loud street noise directly outside, but I slept like a baby! Clean and comfortable for one night stay.Fridge was stocked up with basic needs,but no tea making facilities,hotel security was adequate. the underground passes was found late.it was unfortunate the construction work across the road was 24/7 non stop, and we could not sleep with open windows, even then it was noisy.We loved the freshly cooked falafel at breakfast. i stayed here in April 2010. free airport pickup for a 2-night hotel stay or longer. great location, many western tourists, right opposite the Eqyptian Museum, rooms have view to museum. little noisy at night due to the street facing rooms. but it is city center so its normal. rooms are clean with TV and mini bar and staff are friendly. the hotel entrace and building looks not nice from outside and you need to take a lift to the 5th floor to the reception. but the hotel itself is all good.